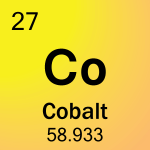 Cobalt is atomic number 27 on the periodic table and element symbol Co. This hard, blue-gray transition metal is used in alloys and imparts a blue color to glass. Here are cobalt facts, including its properties, uses, and health effects. Cobalt is atomic number 27 with element symbol Co on the periodic table. Discovery: Cobalt compounds have been used since the Bronze Age to impart a blue color to glass. Swedish chemist Georg Brandt discovered the element around 1735. Name: The element name cobalt comes from the German word kobold, which means “goblin.” Miners called cobalt ore kobold, referring to the toxic vapors released during smelting and the way cobalt ore messed up the smelting process for nickel or copper. Cobalt ore typically contains arsenic oxide, which poisoned miners and smelters. Properties: Cobalt is a hard, brittle transition metal that resembles iron or nickel. Its most common oxidation states are +2 or +3. The element is magnetic, with a magnetic permeability about two-thirds that of iron. The metal forms two allotropes. Under 400°C, the beta form predominates. The alpha form is more common at temperature above 400°C. The melting point of cobalt is 1495°C and its boiling point is 2870°C. Its specific gravity is 8.9 at 20°C. Uses: The blue color of glass and glazes used in ancient Egypt, Pompeii, the Tang dynasty, and the Ming dynasty come from using cobalt compounds. Today, cobalt blue remains a popular colorant for glass and paint. 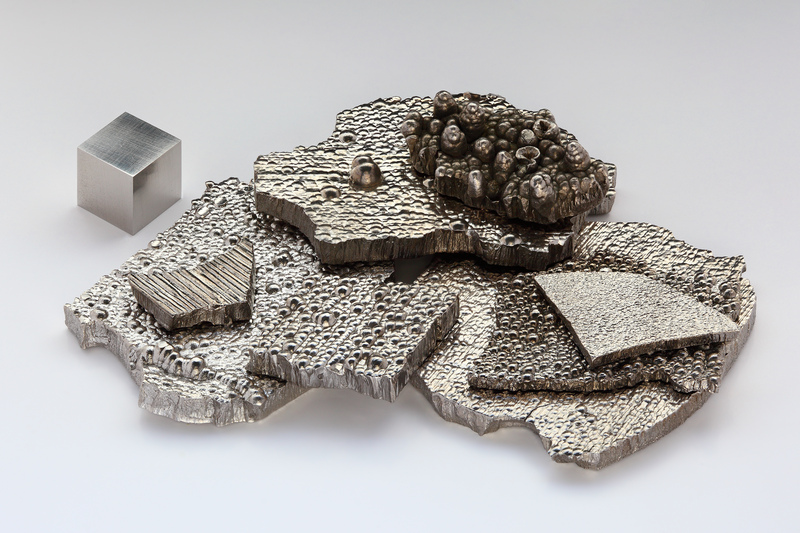 Cobalt is added to alloys to add hardness and corrosion resistance. It is also used to make magnets. The isotope cobalt-60 is used as a tracer, gamma source, and radiotherapeutic agent. It is also used to sterilize food. 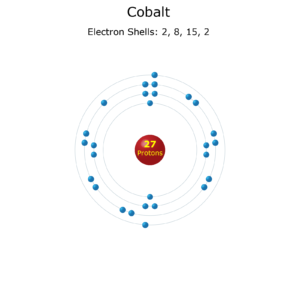 Isotopes: The only stable isotope is cobalt-59. 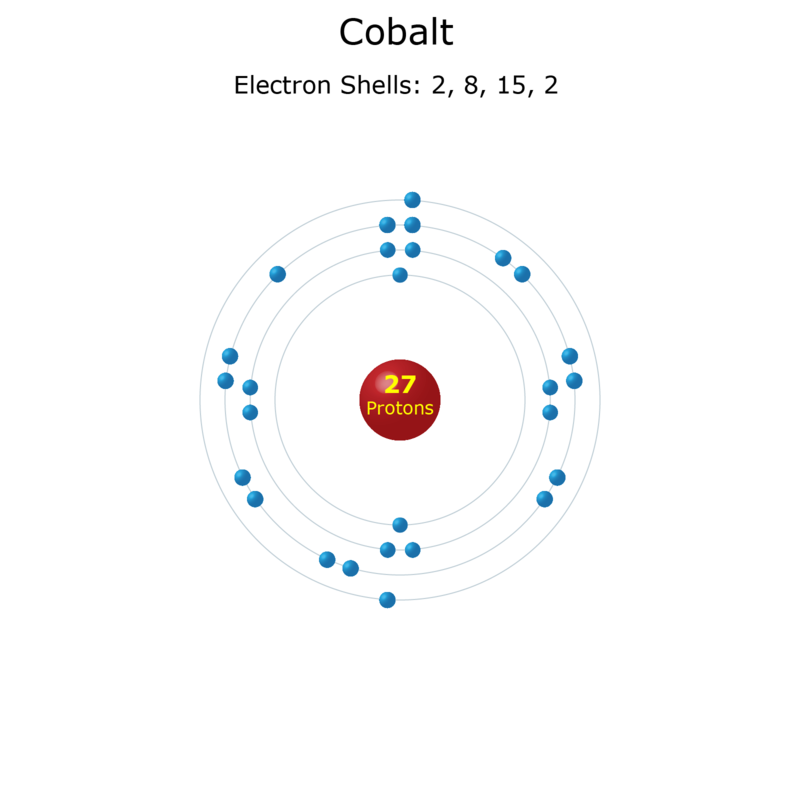 There are twenty-six known isotopes, from Co-50 to Co-75. Cobalt-60 is an important radioisotope for research, commercial, and medical purposes. Its half-life is 5.27 years. Cobalt is also used to make a type of “dirty” bomb, known as a cobalt bomb. Biological Role: Cobalt is an essential trace element for human, animal, and plant nutrition. It is part of the vitamin B-12 molecule. However, like iron, over-exposure to cobalt may cause potentially fatal medical conditions. Like nickel and chromium, cobalt causes contact dermatitis upon skin contact. It causes respiratory distress when inhaled. It is a natural component of tobacco smoke. In 1966, cobalt compounds used to stabilize beer foam caused a condition known as “beer drinker’s cardiomyopathy.” The LD50 for cobalt salts ranges from 150 mg/kg to 500 kg/mg. Sources: Cobalt forms in supernovas via the r-process. The element exists in many compounds, but not in pure (native) form. Sources of cobalt include the minerals smaltite, erythrite, and cobaltite. Cobalt occurs with nickel, copper, silver, iron, and lead ores. The element is also found in many meteorites. Appearance: Cobalt is a lustrous, hard, blue-gray metal.